The Haul-All recycling system is ideal for urban and rural applications, achieving diversion rates equivalent to curbside at 30% of the cost. 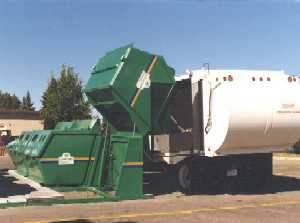 The Haul-All recycling system consists of aesthetic, user friendly containers and side loading collection vehicles. The containers are welcomed by major retail and commercial tenants in strategic locations which increases user convenience. The Haul-All side-load collection vehicle requires less loading space than front or rear load equipment. Depots are located in high-use, high-profile locations. This location strategy maximizes community awareness, acceptance and participation. With various collection options, the system was designed to minimize storage and collection costs with the user in mind.